Jack Keane was an Irish Miner out of Ballarat. He'd been prospecting for over 8 years finding pretty much nothing. 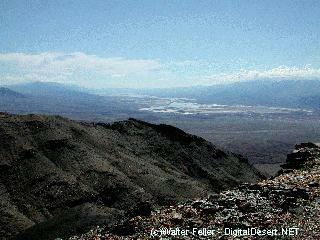 One day in 1903 he discovered a ledge containing rich ore in the Funeral Mountains. Jack and his partner sold the claim immediately for $150,000 -- but they got the mine back after a year. Jack stayed associated with the mine until he shot and wounded a constable in Ballarat. He sold out and returned to Ireland. One night in a tavern, Jack was in a fight and killed a man -- He died in an Irish prison. keane wonder mine, death valley gold mines, mills. 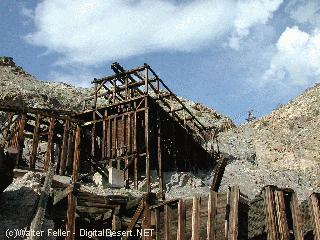 death valley gold mines and mills, keane wonder mine. keane wonder mine ore tram , death valley gold mines, mills. 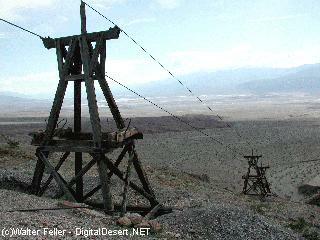 death valley history - keane wonder mine, death valley gold mines, mills. The geology of Keane Wonder Mine, Central Death Valley, Death Valley regional field guide. 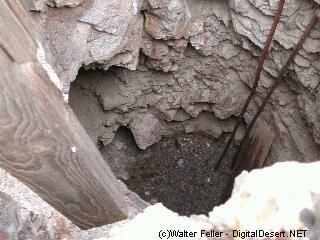 Vertical shaft at Keane Wonder - Sometimes a hole looks like a hole. This tramway would carry the gold down to the mill. The mill, where gold ore would be crushed for further processing.